Regular expressions are an essential and useful skill even outside of programming. They can serve not only as a handy tool for anyone whose work involves writing or data, but also act as a gateway into more interesting and complex kinds of programming. 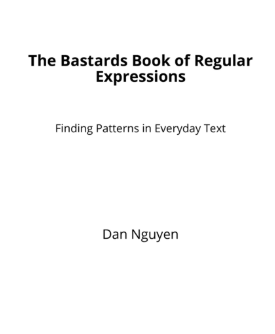 This book takes a very hands-on approach to solving the needs of the majority of regular expressions users who simply need to manipulate data. You'll learn what you can use, and you'll learn it methodically, systematically, and simply. Dan Nguyen is the author of the still-incomplete Bastards Book of Ruby and Photography. He is currently Head of Data at Skift and was formerly a news application developer at the investigative newsroom, ProPublica.